How do we do it? 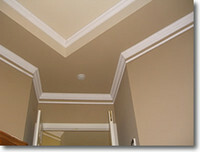 Instead of cutting and fabricating materials onsite in your home, we perform most of this work in our shop. By using sophisticated measurement technology in your home and advanced tools in our warehouse, we provide clients with the highest quality product and a streamlined installation. Our innovative approach also enables us to complete smaller jobs at a lower cost—projects otherwise unprofitable for most contractors. At Just Moulding, We Know What It Takes to Make Franchising Work. Experience A New Dimension In Home Improvement. To learn about our unique franchise opportunity and find out what it takes to become a Just Moulding franchisee, please contact us now!